The liver is a biochemical laboratory in the body, which carries more complex processes. It is responsible for the decomposition of the produced toxins. Often excessive intake of medicines, improper diet and certain bacterial and viral infections leave some consequences and not rare pose a threat to the health of the liver. The procedure for cleansing and detoxification of this organ using raisin water (besides cleaning the body with rice) is very powerful method for recovery of the organism and its relieving from toxins and many chronic diseases, because the intoxication of the body prevents it to include a mechanism for self-healing and also significantly reduces the effectiveness of drugs and recipes of traditional medicine. Liver in the body acts as a factory for blood. It also helps to strengthen and to stimulate the digestion. The liver also performs another function in the body and it is cleaning the blood and removing all the toxins and waste products from it. Hence it is clear that clean liver means health, vitality, energy, nice appearance and good mood. Doctors often recommend that you eat raisins in the morning to take better care of your heart, eliminate bad cholesterol, lower your triglyceride levels, and prevent constipation or an upset stomach. Raisins are a natural source of vitamins and minerals, but those benefits are increased tremendously if you consume the water that they are soaked in. This is because the sugar content is reduced, and you’re still obtaining an excellent medicinal remedy for the liver. Raisins are one of the best natural sources for antioxidants. All you need to remember is that they’re just dried grapes, which are a fruit that’s rich in bioflavonoids that help protect you from free radicals and strengthen your defenses against disease. 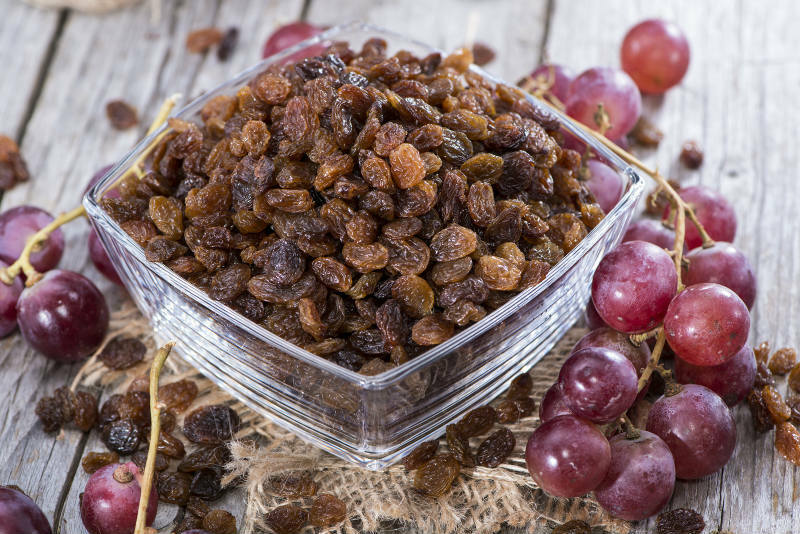 Raisins and raisin water have been traditionally used to prevent the occurrence of various heart and liver diseases. It’s worth keeping in mind. Cleaning the liver with black grapes begins with the following procedure: first choose quality organic raisins that today we cannot find quite easily. You should avoid very light, nice yellowish raisins. Bright color of raisins is a result of the treatment with sulfur dioxide or in the best case of violation of the rules during the drying. Do not pay attention to the “glowing” raisins, which is also chemically treated. Quality raisins are without luster, wrinkled, not too soft, nor too hard (soft like rubber). Grains must be preserved and not damaged. Good raisins must be dark or with brown color (if it comes from brighter grape variety – then it has a light brown color). There is also a black raisin with blue shade, which gets darker varieties of the wine. It would be ideal if you can find raisins in small stalks on the grapes, which is one of the main indicators of naturalness of raisins. Once you select the right and not chemical treated raisins, then you can begin to prepare the asset for cleaning the liver. Put a half of a cup of raisins in hot water in the morning. After 15 minutes wash the raisins well with running water. Place the washed raisins in cup and fill the cup to the top with boiled water that is cooled to room temperature. Leave the grapes so stand 24 hours (to the next morning). The next morning drink the potion and eat the raisins on an empty stomach. Follow this regimen for four days, at least. Have everything prepared to drink your raisin water the minute you wake up the next morning. Perform this treatment once a month, and it has no side effects. What’s most interesting is that you avoid the high sugar intake that is normally found in raisins. If you also follow a diet that’s low in fat and includes plenty of fresh fruits and vegetables you’ll promote better liver health overall, and raisin water makes an excellent complement to your routine.